Science in the News - The history and science of vaccines: what, how, WHO, why? In 2000 the United States declared measles was eradicated thanks to the MMR vaccine; two decades later, the World Health Organization has reported that outbreaks are on the rise. Vaccines are a powerful tool for protecting ourselves, our loved ones, and our communities from disease. But many fear that they carry their own risks, and don’t participate. So what are the facts, and what are the stakes? Join three local scientists from the University of Colorado to discuss the history, science, and medicine of vaccinations. Can you explain your research in under 3 minutes without using any technical jargon? Here's your chance to try! The goal of the "Gong Show" is to excite the public about scientific research while giving scientists the opportunity to practice their broad communication skills. To do this, presenters give a 3-minute elevator pitch that succinctly describes what they do. If they use too much jargon, go off on a tangent, or the audience gets bored, listeners can "gong" the presenter with provided noise makers! If you are "gonged": Don't panic! You won't get pulled off stage by a hook; you will just have to stop and explain more clearly. Science in the News - Why Haven't We Found A Cure For Cancer? It’s 2018 – with all the latest medical advancements, why does cancer still kill half a million Americans each year? What makes it so difficult and expensive to treat? What new techniques are being developed to study and treat cancer, and who’s going to pay for them? What role can you play in the fight against cancer? 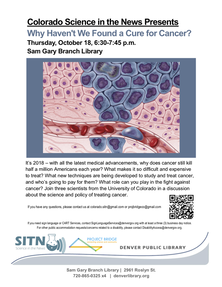 Join three scientists from the University of Colorado in a discussion about the science and policy of treating cancer. A cure for genetic diseases. Malaria-free mosquitos. Designer babies. Are these science or science fiction? With CRISPR, a powerful new tool that scientists harness to edit DNA, these may be closer to reality than we think. But how does gene editing work? What can it do? And most importantly, what should we do with it? 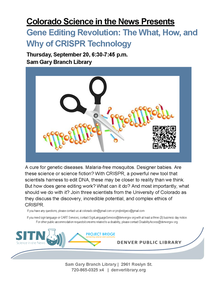 Join three scientists from the University of Colorado as they discuss the discovery, incredible potential, and complex ethics of CRISPR. 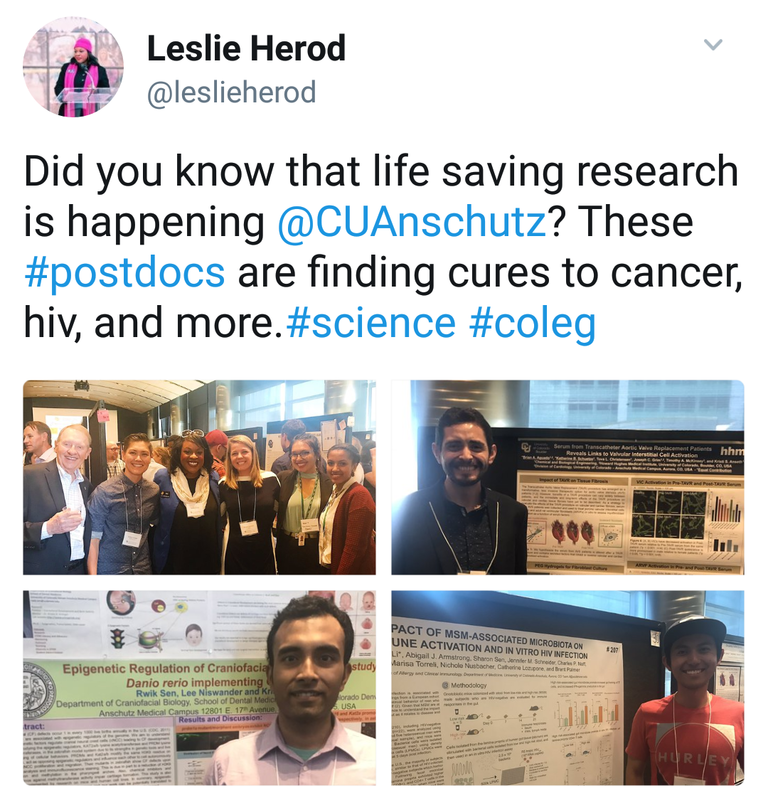 ​Project Bridge Colorado was excited to host State Representative Leslie Herod (HD 8) at our annual Postdoctoral Research Day Poster Session and to share with her the excellent research being conducted by our community of early-career researchers. ​and social health. To commemorate the event, Governor John W. Hickenlooper officially declared January 19th, 2018 as 'Early Career Scientist Day' in Colorado! The Digital Abstract Book from Colorado Science Day can be found here. Project Bridge hosted monthly science demos at the Dahlia Campus for Health & Well-Being Farmers Market in North Park Hill. Our demos covered a range of scientific topics including an exploration into how the senses of taste and smell work together during flavor perception, a discussion of the solar conditions that cause an eclipse, an exploration into how biosensors work, and a spooky Halloween demonstration of material states and transitions. ​Project Bridge Colorado and the Postdoctoral Association hosted state legislators Chris Hansen (HD 6), Chris Kennedy (HD 23), Mike Weissman (HD 36), and Leslie Herod (HD 8) at our annual Postdoctoral Research Day Poster Session. Through this program, our guests learned first hand about the exciting biomedical research being performed by our community of early career scientists. In partnership with the CU Denver|Anschutz Career Development Office, we created a workshop on crafting scientific elevator pitches and personalizing these science stories to different audiences. Members of Project Bridge Colorado joined the CU Denver|Anschutz and CU Boulder Postdoc Associations to support the 1st annual March for Science. 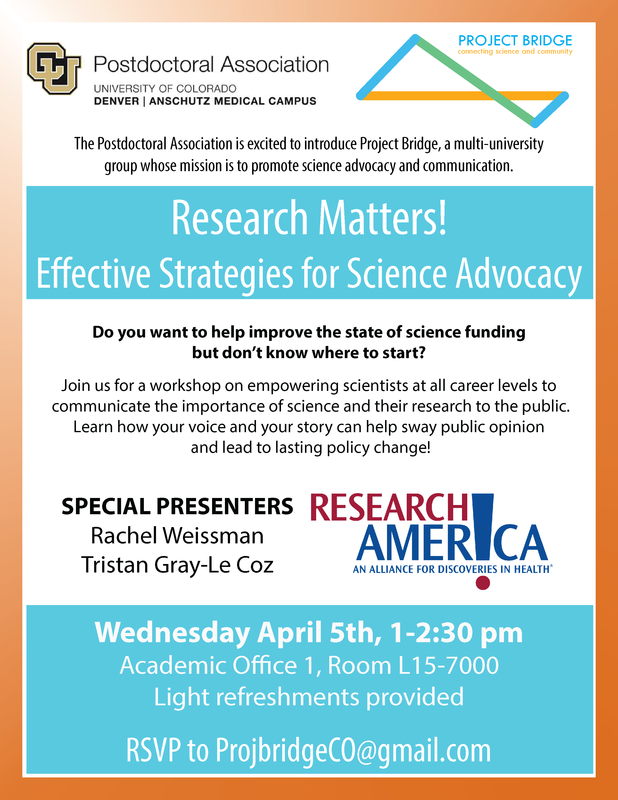 Join special presenters Rachel Weissman and Tristan Gray-Le Coz of Research!America for an afternoon that will empower scientists at all career levels to effectively communicate their research to the public. The format will be a 1 hour workshop followed by 30 minutes of Q&A. We look forward to seeing you there! Slides from this workshop can be viewed here! 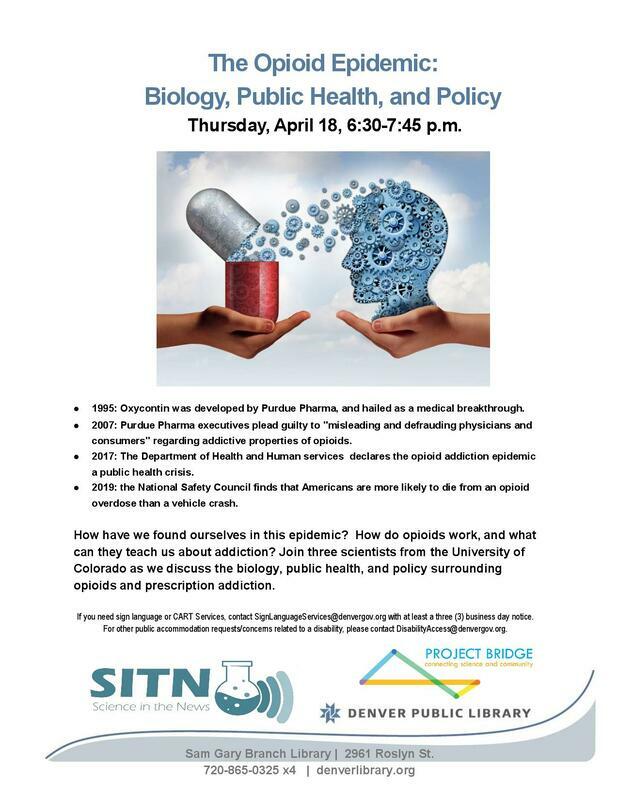 our first Project Bridge Colorado event!